With article 50 triggered, the clock is ticking: the UK government has less than two years to reach a settlement in what is going to be the ‘mother of all divorce cases’. With the Tory government having been, up until now, deliberately vague about what it seeks to achieve during the negotiations, the predicted outcome of Brexit is based on unwarranted optimism at best and catastrophe at worst. This is not what the British people voted for. It’s not the job of politician’s to support a suicidal Brexit strategy predicated on a racist narrative and false promises written on the side of a bus, but to scrutinize claims and represent the best interests of their constituents by voting accordingly in parliament. There was never any compulsion to follow- through on a referendum based on falsehoods or pandering to racists. In my view, the Labour opposition could and should have done more to defend the Remain campaign from the crass opportunism of their opponents. Labour missed an ideal opportunity to capitalize on Tory divisions over Europe exemplified by Theresa May’s lies and dramatic u-turns. The main beneficiaries of such complacency have been the Liberal Democrats who are stealing many of the 48 per cent of disenchanted English and Welsh voters who voted Remain from under Labour’s nose. What Corbyn seems to be banking on is that enough people will buy into his ‘island of socialism’ narrative. 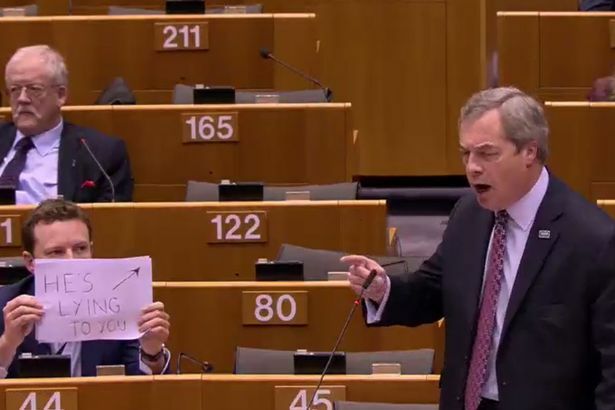 This appears to involve his rejection of the notion that the EU, as an international institution, is synonymous with an internationalist conception of socialism. That’s not to say the EU is a perfect international institution – far from it. But its effectiveness in the progressive sense is dependent upon the nature of the governments who control it. Rather than retreating into the concept of an inverted socialist vision, it’s my view that Corbyn would have been better served by maintaining a strategy of solidarity with other pro-EU socialist colleagues within Europe by helping to create a much more integrated and supranational form of political organisation at the European level and thus radically helping to change the direction of EU policy. Big capital can only be countered by big institutions. Much of the Tory austerity drive has to do with the systemic and structural limitations associated with state power at the national level. The “pooling of national sovereignty” which implies greater European integration and federalization, goes some way to addressing these limitations, which is no bad thing. Regardless, many of those who favour greater integration in principle, falsely believe that the lackluster performance of the Euro undermines it. In truth, the national schadenfruede that culminated in the British government’s reaction to the performance of the Euro, is a red-herring. The problem, as Craig Murray recognized, is not currency union, but the lack of any fiscal union. The one is not feasible without the other. The economic argument for the alleged failure of the EU as an economic project, therefore, cannot be made on the basis of the relative weakness of the Euro, but rather on the lack of any implementation of a fiscal union. Similar unjust criticisms are leveled at EU legislatures as the basis for arguing for UK withdrawal from the union. The anti-EU right have attempted to roll back the powers of both the EU Court of Justice (ECJ) and the European Court of Human Rights (ECHR). The Brexit establishment has objected to some of the humane rulings of the ECHR. In particular, this includes the protection of the human rights of immigrants at risk of being deported by the UK. The ECHR is itself outside the remit of the European Union. But the ECJ is bound by the overarching decisions of the ECHR when ruling on matters of specifically EU law. The Tories want a “British” convention on human rights to replace the European convention which if achieved, would further seriously undermine civil liberties and human rights in Britain. Given the numerous advantages of the EU described, it seems strange that Corbyn hasn’t come out more stridently in public to defend the notion that more, not less, European integration is needed. The labour leader’s calculated rejection of the Remain position is a risky strategy. It’s one in which he seems to be prepared to put all his eggs into one basket. We will know closer to the next General Election whether the implications of a damaging Brexit predicated on the isolationist neoliberal approach by those who champion it, will be sufficient enough to engender a return to socialism among the body politic of British society. However, if by 2020 Corbyn’s ambivalence to Brexit backfires on him and he loses the election, it will be the poorest and weakest in society who will pay the biggest price in terms of further cuts to welfare and the undermining of workers rights and protections. Having left the EU, any post-2020 Labour opposition will have to win arguments on these and other key issues such as social legislation and human rights that are currently protected by the EU but which the Tories have long wanted to opt out of. There can be no doubt that in a Brexit Britain under the Tories, many European regulations restricting working hours and other employment and social reforms will be scrapped and working class living standards diminished. This will be achieved through the enactment of something as far reaching as the Great Repeal Act. Embodied in the Statute of Proclamations 1539, the Great Repeal Act will override the preservation of EU law by granting executive powers to enable legislation to be changed by order, rather than through parliament; a method of lawmaking wholly at odds with democracy and accountability. To add salt to the wound, the Tories dream of extending a tax-haven for the super-rich will mean that the 99 per cent will be expected to fund the shortfall of a welfare state depleted of resources. Any future Labour government will be left to pick up the pieces of Brexit against a backdrop in which access to the Single Market both for manufacturing and financial services will of been severely hampered. With the prospect of London losing its role as the world’s leading financial sector to New York, Frankfurt and Paris due to companies’ relocating resulting from lack of tariff-free access, these problems will be further compounded. Already German car manufacturer’s are bracing themselves for a new era of trade tariffs with the UK because Angela Merkel has warned that she is going to put the interests of the 27 remaining EU members first in the forthcoming Brexit talks. The possibility of a country like Australia plugging the gap, has been torpedoed by the decision of that nations foreign minister to consider relocating Australian companies from Britain to Ireland in order to allow the country to keep its access to the Single Market. Meanwhile, across the Atlantic, Donald Trump’s trade chief, Wilbur Ross, has urged Britain’s rivals to exploit the “God-given opportunity” of Brexit to take business away from the UK. These kinds of examples illustrate the nonsense behind the rhetoric of those who argue that Brexit will enable Britain to “take back control”. How does a country take back control of its trade relationships by giving complete control of these relationships to the union it has just left, arguably because its people felt it had too much control of their country? Paradoxically, what the 52 per cent who voted for Brexit on the basis that the EU have too much control did, was to ensure that the EU have absolute control. In other words, “taking back control” is essentially coded language for saying that the remaining 27 EU members will exercise complete control over precisely what relationship the UK will be able to enjoy with the world’s largest trading bloc. “The National Institute for Economic and Social Research predicts that leaving without a deal, and thus falling under WTO rules and tariffs, would reduce real wages by between 4.6 per cent and seven per cent. A leaked Treasury report also warns that leaving the EU with no trade deal is the “alternative to membership with the most negative long-term impact” and would cause a “major economic shock”. Then there is the issue that the British people voted for Brexit on the basis that in so doing they would ensure parliamentary sovereignty would be reclaimed. But, as the government’s Brexit White Paper reveals, this is yet another false argument. Parliament has “remained sovereign throughout our membership to the EU”. Even the suggestion that the fishing industry has a glittering future as a result of Brexit falls apart given that 60 per cent of fish landed in British ports arrives in Scotland which voted to Remain. Meanwhile, the DUP’s Nigel Dodds seems to be suggesting that Sein Fein are poised to head for full unification of Ireland which means the UK won’t exist anymore. Then there is the issue of Scottish independence. A few days ago the Scottish parliament voted for another referendum. This puts Theresa May in a difficult position. On the one hand, the woman who argued that “we need more unity” while undertaking negotiations that guarantee disunity, can’t be seen to be granting Scotland a referendum. This is because if she loses she will be forced to resign. On the other hand, if May does grant Scotland a referendum and puts a date on it, she will send her negotiators to Brussels without knowing what her own country looks like. Michael Howard’s jingoistic remarks over the British money laundering tax haven, Gibraltar – 96 per cent of whose residents voted Remain – will undermine Britain’s negotiating position no matter what approach May decides to take. It’s quite possible to envisage a situation in the near future in which the “country we got back” consists of nothing more than England and Wales. We are going to get control of our borders, but according to leading Brexiteers this is not going to change immigration much, because we actually benefit from immigration overall. We are going to get control of our laws, but according to leading Brexiteers this does not mean that anything much will be changed. At most we might tweak a few little things here and there, but Brexiteers don’t know what things. We are going to get control of our money, except that we are likely to end up losing money as a result of the loss of trade with the EU27. We will probably lose about the same as we gain from not paying the famous £350 million. We are going to be able to strike trade deals with countries outside the EU, just like the trade deals that we currently benefit from by being inside the EU. We are going to leave the ECJ, and then negotiate an identical arrangement to settle trade disputes. We will agree to be bound by whatever the independent new adjudicators adjudicate, just like being in the ECJ, because if we didn’t do that it wouldn’t be the independent arbiter of trade disputes that every trade deal needs. Very succinct argument as to why Brexit is mad and why the Labour leadership are totally myopic. « Justice for Alexander Blackman. But shouldn’t Fallon have been in the dock too?